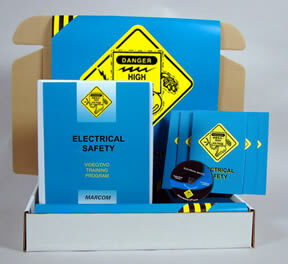 Description: MARCOM's "Electrical Safety" Safety Meeting Kit™ reminds employees about electrical hazards they may face in their jobs, and provides the information they need to work safely around low voltage electricity. Electricity is all around us. It lights up our homes... powers much of the machinery and equipment that we use... and runs many of our tools. We are so used to it, most employees "take it for granted." Yet electricity can also be dangerous. Employees need to know how electricity works, and what they should do to protect themselves from its hazards. This program also satisfies the OSHA training requirements under 29 CFR Part 1910.331 (Electrical Safety Standard) for "non-qualified" employees. Materials in the Kit include a Videotape Program, five motivational Posters, and 30 Employee Booklets. The Posters in the Kit remind employees to work safely and to avoid injuries. The Videotape and Employee Booklets include information on how electricity works, fuses and circuit breakers, grounding and GFIs, safe work practices, outlets, plugs and extension cords, working with electrical equipment, using ladders around electricity, electrical emergencies, and more. The Videotape Program in the Kit comes with a comprehensive Leader's Guide, reproducible Scheduling & Attendance Form, Employee Quiz, Training Certificate and Training Log.